Christine Blasey Ford is sworn in before the Senate Judiciary Committee, Sept. 27, 2018 on Capitol Hill in Washington. The first woman who accused Supreme Court nominee Brett Kavanaugh of sexually assaulting her decades ago provided detailed and emotional testimony Thursday before a Senate panel, saying she is “100 percent” certain of her attacker’s identity and that she feared Kavanaugh was "going to accidentally kill" her during the alleged ordeal. Christine Blasey Ford recalled a 1982 house party that she attended along with Kavanaugh, his friend Mark Judge and others. She alleged that Kavanaugh and Judge locked her in a bedroom and that Kavanaugh forced himself on top of her. "He began running his hands over my body and grinding into me. I yelled, hoping that someone downstairs might hear me and I tried to get away from him but his weight was heavy," she told the Senate Judiciary Committee. Ford said Kavanaugh tried to unclothe her but "had a hard time because he was very inebriated" and because she was wearing a bathing suit under her clothes. "I tried to yell for help," Ford testified. "When I did, Brett put his hand over my mouth to stop me from yelling. This is what has terrified me the most," she said. She alleged Kavanaugh and Judge were "drunkenly laughing during the attack," which she maintained "has drastically altered" her life. Kavanaugh has denied all allegations of sexual misconduct and was expected to testify after Ford. A prosecutor, Rachel Mitchell, is asking questions at the hearing on behalf of Senate Republicans, asking Ford about timelines and peripheral issues but not challenging her basic account of sexual assault. Senate Judiciary Chairman Chuck Grassley, R-Iowa., talks during a Senate Judiciary Committee hearing with Christine Blasey Ford, Sept. 27, 2018 on Capitol Hill in Washington. 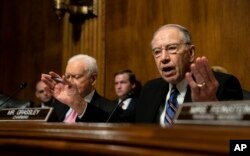 Senate Judiciary Committee Chairman Chuck Grassley opened the hearing by defending the Supreme Court nominee and blaming Democrats for not disclosing the accusations earlier. "As part of Judge Kavanaugh's nomination to the supreme court, the FBI conducted its sixth full field background investigation if Judge Kavanaugh since 1993 25 years ago. Nowhere in any of these six FBI reports ... was there a whiff of any issue, any issue at all related to anyway inappropriate sexual behavior." Grassley also blamed the committee's ranking Democrat, Dianne Feinstein, for not revealing accusations she received from Christine Blasey Ford in July. Feinstein defended her handling of what was originally an anonymous allegation by Ford, and said the FBI should have investigated the matter. 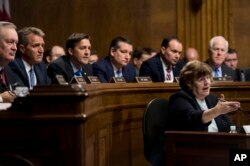 Phoenix prosecutor Rachel Mitchell questions Christine Blasey Ford as Senators, from left, Sen. Mike Crapo, R-Idaho, Sen. Jeff Flake, R-Ariz., Sen. Ben Sasse, R-Neb., Sen. Ted Cruz, R-Texas, Sen. Mike Lee, R-Utah., and Sen. John Cornyn, R-Texas, listen during the Senate Judiciary Committee hearing, Sept. 27, 2018. In an advanced text of his opening statement, Kavanaugh vehemently denied Ford’s account as well as accusations by others, characterizing them as last-minute smears. He said such character assassinations — if allowed to succeed — will dissuade competent and good people of all political persuasions from serving the nation, and added that he would not be intimidated into withdrawing from the judicial selection process. President Donald Trump selected Judge Kavanaugh to replace Justice Anthony Kennedy, who was a “swing” vote on the Supreme Court and sometimes sided with liberal justices on key cases. Kavanaugh’s confirmation could solidify a conservative majority on the court for a generation. On Wednesday, President Trump accused Democrats of drumming up sexual-misconduct charges against Kavanaugh. “They are actually con artists because they know how quality this man is and they have destroyed a man’s reputation and they want to destroy it even more, and I think people are going to see that in the midterms, what they have done to this family, what they have done to these children, these beautiful children of his and what they have done to his wife. They know it is a big fat con job,” Trump said. Other women have come forward in the past few days with detailed complaints about Kavanaugh. He has denied all the allegations. Trump said he would watch Thursday’s potentially explosive Senate hearing and that he could still change his mind about his nominee once he hears what Ford has to say.